Islamic State Mints Money: US_NATO’s Collateral Creation. USA wants to get Qatar Gas to Europe to break Russian Gazprom’s preferred gas-supplier status to Europe and end German/EU addiction to Russian gas. That would break Putin’s independent back and end umbilical bond of geography and economics between Germany and Russia. Qatar gas pipeline has to run through Syria and Turkey to reach Europe’s doorstep. President Bashar Al Assad -a staunch Russian ally- therefore had to go. The plot to overthrow him was set in motion in 2011. The plot keeps on boiling and thickening even after 4 years. The latest US/NATO war in the Middle-East, like 3 others earlier still unfinished, have together claimed millions of innocent civilian victims directly or indirectly. USA evolved a neat, sanitised term to describe such colossal and horrific human tragedy: “Collateral Damage [CD]”. That makes horrific murders of civilians sound like regrettable but unavoidable and inevitable outcomes neatly sanitised for the consumption of home crowds. For this strategic and never ending war on terror that allows unilateral, at will, aggression on sovereign countries in complete disregard of United Nations, a bogey man is needed. Though the latest and scariest monstrosity goes by the name Islamic State [IS], it has had numerous iterations in the past: Islamic State of Iraq and Syria [ISIS], Islamic State of Iraq and Levant [ISIL], Al Nusra Front, Al Qaeda, Al Qaeda in Islamic Maghreb [AQIM], Al Qaeda in Arabian Peninsula [AQAP], and so on. Before the Collateral Damage has a chance to unfold in all its gore and horrors, USA must have its desired bogeyman erupt in the targeted nation/geography so that it can declare war on it. This process of “Bogeyman creation” has missed a proper euphemistic label so far. It should be aptly called, Collateral Creation [CC]. CD is the obverse of CC– One cannot exist without the other and each feeds into the other. Now only the dumbest would believe that all these terrorists are free agents when in several instances it has been documented how USA/NATO and their barbaric GCC allies have spawned them across the board. Sadly, the dumbest still make up the majority fed as they are on the diet of spurious and concocted news manufactured by mainstream media [MSM]. Erstwhile top secret Pentagon Report obtained after it was declassified by Judicial Watch under Freedom of Information Act [FOIA] clearly warned US administration that a Salafist Principality [IS] in Syria would be the result of the policy of supporting violent Islamist insurgent groups like AQI, Al Nusra front etc. that were fighting Assad led Syrian government. According to the newly declassified US document, the Pentagon foresaw the likely rise of the ‘Islamic State’ as a direct consequence of this strategy, and warned that it could destabilize Iraq. Despite anticipating that Western, Gulf state and Turkish support for the “Syrian opposition” — which included al-Qaeda in Iraq — could lead to the emergence of an ‘Islamic State’ in Iraq and Syria (ISIS), the document provides no indication of any decision to reverse the policy of support to the Syrian rebels. On the contrary, the emergence of an al-Qaeda affiliated “Salafist Principality” as a result is described as a strategic opportunity to isolate Assad. -: Insurge Intelligence. Washington -Blog. Islamic State seared into the “conscience” of the people because of MSM’s lusty publishig of Islamic State produced professional clips of deliberate Throat cutting, Beheadings, and occasionally Caged Burnings of opponents. As if these were essential to tip the scale to force “reluctant” USA and NATO states to take on this newest monstrosity, which they were otherwise unwilling to confront. The remarkable thing about these clips was that they were no amateur, clumsy attempts to capture the sensational on the ubiquitous cell-cameras. Jihadi Terrorist == Precious Metals. Islamic States == Coins made from Gold and Silver. Therefore, stay away from both. The film talks economics with ease and at times rare insight. It speaks of end of Gold Standard by Richard Nixon in 1971, the fractional reserve system or how money is loaned into existence by just about any bank [as BOE acknowledged -the first and only central banker to do so], or even the Petro-dollar system that has protected USD as world’s reserve currency from getting unhinged. It is unbelievable that the film of such “sterling qualities” has been produced by the savages that masquerade as Islamic State. What is unbelievable is probably not true. 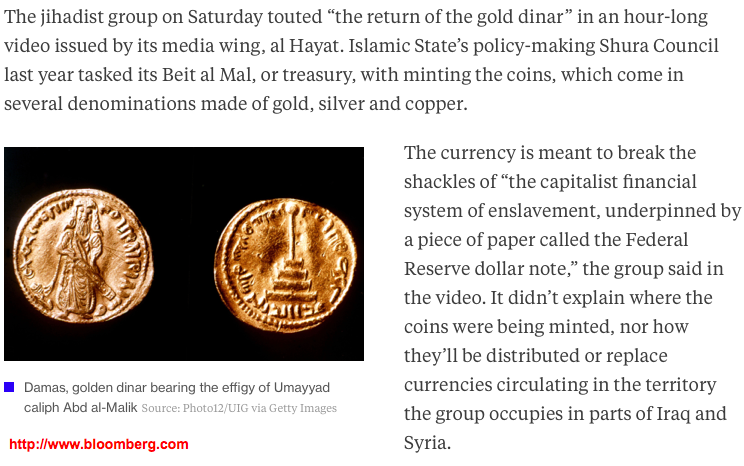 Over to the film, “The Rise of the Khilafah and the Return of the Gold Dinar“. PS: Russians have now joined the Syrian war theatre. “The White House and State Department said Thursday that it was monitoring reports that Russia is carrying out military operations in Syria’s civil war on behalf of President Bashar al-Assad, with both warning that such actions would further destabilize Syria’s perilous situation. Syrian state media reported this week that Russian forces were fighting alongside Assad’s army. The Times of London reported Thursday that video shot by a militia loyal to Assad and aired on SANA, Syria’s state-run television station, showed troops backed by an armored vehicle. The newspaper also reported that Russian voices could clearly be heard in the film, which claimed to show government forces fighting rebels in the Latakia Mountains, near Syria’s Mediterranean coast.“. Russians say they are there to fight IS, stabilise Assad. USA/NATO says they are there to fight IS, but to overthrow Assad. Ditto with Saudi Arabia and UAE. Turkey says they are there to fight IS but target Kurds and support IS. Now no one can object because everyone is on the same side; the side that says it is there to fight IS. The real geo-political agenda of each actor is now buried under all these bogus, self-serving proxies.